As the world’s climate heats up, will we continue to use more energy-intensive air conditioning, generating ever-higher greenhouse gas emissions? It’s a valid question for the first full day of summer, considering that the average American household already uses 2,822 kWh of energy each year to cool off, spending $276 a year. The answer will likely depend on building efficiency measures and new cooling technologies like these efficient new bladeless fans announced today by Sir James Dyson, of vacuum fame. The inventor’s new fan is the opening salvo, he says, in his war on air conditioning. The fan works like a jet engine, sucking air into a cyclone accelerator that amplifies it 15 to 18 times before blowing it out over an airfoil-shaped ramp. As that air is blown out, more is sucked in from behind. With no blades, the airstream is smooth and the contraption is easy to clean and more difficult to break one’s finger in (just sayin’). The fan runs on a modest 40-watt motor. Dyson’s fans may not be the final answer to staying cool in a warming climate, but they’re certainly a step in the right direction. Normally a portable air conditioner requires a host sticking out a window, how does Dyson's air conditioner works? I see no host. Can you please explain. I am talking about air-con and not a fan. how much elec does the heat/cool use? I pay the bills.. This new Dyson product is useless for cooling. Moving air does not cool anything. Our new developed swamp cooler without the negatives like moisture in the room cools really and consumes 30 % of the energy of your AC with the same cooling capacity. One thing I would like to say is the fact that before purchasing more personal computer memory, check out the machine within which it would be installed. In case the machine is running Windows XP, for instance, the memory ceiling is 3.25GB. The installation of a lot more than this would just constitute just a waste. Make sure that one's motherboard can handle this upgrade volume, as well. Thanks for your blog post. This could possibly be modified to create something truly spectacular. I'm buying one to invent or recreate something special. Perhaps I'll return here to let others know. This seems to cool better because it seems to move a lot more air, but the air needs to be chilled a bit by something. I don't know if 40 watts is a lot of energy, compared to other fans, it's probably more efficient which can save energy money spent over time if you use a fan. This is just a fan. It doesn't do anything a normal $20 fan doesn't do, it moves air around, which is useful, but hardly a replacement for AC. (you can run your AC in fan-only mode, and save 95% of the energy, but people dont -- I wonder why ?) The main difference between this, and an average fan, is a) that it looks interesting, and b) that it costs 20 times the price. Neither of these two properties will do anything at all to reduce AC-usage. If a fan is bladeless then is it really a fan? Anyway, Dyson's own web page explains their new device and it has fan blades - they just don't have to be as fast moving, and so I presume are quieter and use less energy. The real innovation is the induction and amplification of that air movement. But don't call it bladeless. Hide the fan blades in a cyclone and call it the new fan, then mark up the price tag of the plastic contraption 1000%. At least they are cool to look at. The guy knows how to fool em, but this ain't nuthin new. Run a culvert through the stable temperature of earth berms beside the house, and let the chimney effect pull it in, that's real genius. I still can't find a single article about Michael Reynolds work on your site. Are you guys daft? The guy is at the top of the green revolution. 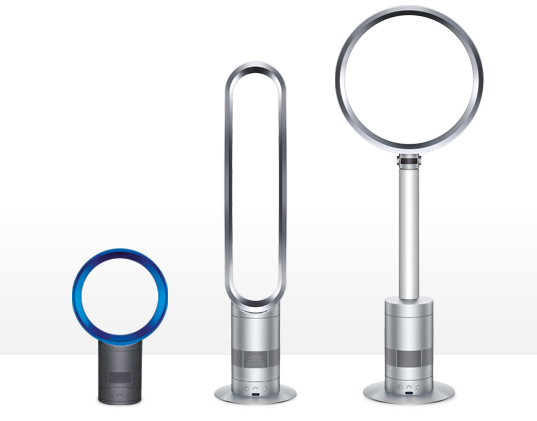 I'm sorry but despite the lovely designs, Dyson is nothing more than a self propelled hype machine. One who is not above lying about their products (Blade style hand dryers have been used in Japan for at least the past decade). If dyson is really trying to combat air-con, this make this affordable, then not only can a no one match the tech, but no one would be able to touch them in the market. I really like dysons tech. Only things is it not attainable by the mass. Not everyone has $500 to drop on a fan. As the world's climate heats up, will we continue to use more energy-intensive air conditioning, generating ever-higher greenhouse gas emissions? It's a valid question for the first full day of summer, considering that the average American household already uses 2,822 kWh of energy each year to cool off, spending $276 a year. The answer will likely depend on building efficiency measures and new cooling technologies like these efficient new bladeless fans announced today by Sir James Dyson, of vacuum fame. The inventor's new fan is the opening salvo, he says, in his war on air conditioning.